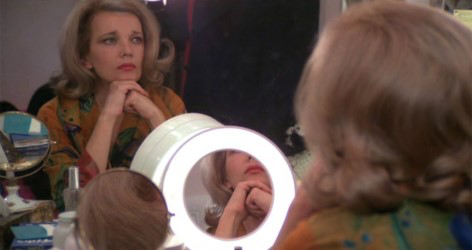 John Cassavetes’s Opening Night (1977) is as arresting a reflection on the experience of female aging as it ever was. It sets up a complex construction: a film about a play where cinema, theatre and real life mirror each other. Even casting here is a kind of warped reflection: its star, Gena Rowlands, plays actress Myrtle Gordon whose career follows a similar arc to Rowlands’s own. In real life Rowlands was married to the director who in the film plays Myrtle’s ex as well as her husband in the theatrical play. We watch Myrtle as she struggles with how to play a woman of around her own age in a stage production. She is tormented by performing a character so like herself. This is unsurprising. Images of Myrtle are constantly reflected back at her in the form of her lovers and colleagues’ opinions of her. She is, by turns, pronounced a ‘beautiful woman’ but also too ‘successful’, too ‘strong’, to even be a woman, or desirable. And at the same time, alternative archetypes of womanhood confront her everywhere in the guise of the characters she encounters – a young fan who idolises Myrtle; Dorothy, the successor in her ex’s life; and the playwright who stands for a woman at the end of her life and successful career. In addition to such acts of mirroring, the interiors of Opening Night are everywhere populated with mirrors. Myrtle and her stage character frequently take us behind the scenes, revealing not only the theatre’s backstage, but also the ‘backstage’ of Myrtle’s own life – her bedrooms, dressing rooms, bathrooms – spaces clustered with looking glasses of varying sizes, shapes and levels of magnification. Places of retreat where, alone, we tend to closely scrutinise our image. And so does Myrtle. This is a well-dressed film, with a striking late-70s colour palette. Intensely red doors, lamps, and carpets contrast with glossy peach fingernails, matte salmon curved walls and lips. The tonal scheme and textures play a role in willfully confusing domestic and theatrical spaces. Myrtle’s worn floor boarded hotel suite actually resembles a stage, further blurring dramatic performance with everyday drama. In contrast with the set, Myrtle’s wardrobe is muted, a response to her anxiety about whom she is performing. She wears simple A-line skirts and shirts in black, brown, or coral, and the camera often turns to her clothes rails – in the theatre, in her hotel – filled with showy dresses left unworn, glittering numbers in tomato red and pink. Myrtle’s choice of large sunglasses is not only to cover up the aftermath of drinking but also to evade the scrutiny of others. They are a shield, a sartorial parallel to her persistent refusal to answer the playwright’s repeated ‘how old are you?’. The film’s costume designer Aleka Corwin recently noted that Rowlands wore mostly her own clothes. Corwin said she ‘made sure to buy [Rowlands] new silk shirts [because she] was so frugal she would not wear new clothing unless someone forced her to’, adding that Cassavetes was also very frugal and ‘tried to get everything for free, succeeding most of the time’. * Indeed, Cassavetes, Rowlands and their friends mostly funded the film themselves and while there is a strong emphasis on aesthetics, it is certainly not of the flashy, overly polished sort. Opening Night ends with a party scene, ostensibly to celebrate the play’s New York premiere. And, as Corwin pointed out, this was also the film’s own wrap party, for which she clothed the crew as guests ‘in every dressy costume on hand’. ** Corwin’s anecdotes confirm Cassavetes’s tendency to seamlessly blend cinema with life. In Opening Night, the dialogue established between the two is an ingenious filmic device, one that is simultaneously confounding and illuminating. The film is like a hall of mirrors. It may be labyrinthine and disorienting but it also delivers an extremely sophisticated – multifaceted – portrayal of an aging woman as she is confronted with the many faces of social convention.